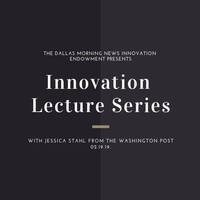 Join us for our first ever Innovation Lecture presented by the Dallas Morning News Innovation Endowment. Our speaker will be Jessica Stahl, the director of audio at the Washington Post. She will be discussing podcasting and other audio storytelling efforts at the Washington Post. The event will take place in the second floor auditorium (BMC 2.106).